This is also a handy music browser if you want to keep Magnatune up on the screen at all times in a small browser window. The general idea is that someone browsing your web site, could also listen to magnatune music while they read. Or, if you have a personal home page you use as your "launch pad", you can put the "Magnatune Mini Browser" on your page, so you always can listen to Magnatune. I asked Scott if Bitty supports the OSX Dashboard or Yahoo Konfabulator, as it'd be great to have a mini magnatune player available at all times, and he said that while he didn't support that right now, it was something he was likely to add shortly. So... if you're interested in having the Magnatune Mini Browser on your own web page, click here. I'm currently in discussions with Allied Vaughn, the company that makes the physical CDs on demand for us, to place specific album art on the packaging. a blank square would be left on the front packaging, where the artist's cover would be printed. Before any of the comments ask... no, we can't include liner notes and other things, as the packaging is standardized and limited to the pre-printed design and can't include other pages. The current price I pay for this product is $4, plus $.97 for shipping, which is passed onto the CD buyer directly without markup. I do have proposals from other suppliers to make cd jewel-case based on-demand CDs, that look very much like commercial CDs, but the per-item price rises to the $6 to $7 mark, before postage, making that choice, I believe, not very interesting to music buyers at magnatune. Hence, the current focus on the standardized packaging. 1) Do I need a publishing company? 2) Should I self-publish? Can I? 3) Is Magnatune going to become a publisher? - you can self-publish. It's easy, and in the USA, free. - I'm not going to be a publisher, because now that I know how publishing works, I know I'd just be taking a cut of your money for nothing more than filling out a few forms with ASCAP. What does a music publisher do for a musician? If Magnatune has had any success licensing your music for film (and we do about 15 film licenses every month, so a lot of you have film licenses) you absolutely should self-publish, because you'll get automatically paid by ASCAP any time those films are shown, and if you're only registered as a musician with ASCAP/BMI, you're only getting half the money you're due. 1) register with ASCAP as a publisher anyway. There's no requirement that you be a US citizen, you simply fill out a W8BEN tax form that they point to, so that the US government doesn't tax the money they pay you. 2) register with the collection society in your country. I can't give much advice on this, other than two anecdotal facts: 1) european collection societies seem to pay musicians more than the USA societies do (based on how much magnatune musicians tell me they get, if they get played on the radio in their country), and 2) the european societies' legal agreements are usually really awful, the societies are aggressively anti-internet, so it might be worth going with ASCAP even if it pays less. Your choice! Re your blog, you’ve omitted a crucial fact about BMI and self-publishing. Through their works registration process and via cue sheet attributions, BMI allows their writer affiliates to designate a work as “author published.” BMI will distribute publishing revenues directly to the author via their writer statement four times a year. There are no extra fees associated with this designation; no muss, no fuss. On the other hand, ASCAP does not offer this option to its’ members. Moving on, both PROs offer membership/affiliation to music publishers as you observe. While it’s true that the application fees differ, your conclusion that one agreement is inherently more punitive than the other is misleading and erroneous. Under your interpretation of the BMI publisher agreement, Sony, Universal, EMI, Warner, and everyone else would be prohibited from direct affiliation with foreign rights societies. That’s just not the case, obviously. In practical application, the BMI agreement is no more restrictive for a publisher than ASCAP’s. But the central point to my request for you to amend your blog is that BMI offers the “author published” option, which is a very easy alternative to setting up a publishing entity with either PRO. It’s a terribly basic piece of info to omit on the subject of self-publishing in America. Because your blog doesn’t recognize this fundamental difference between ASCAP and BMI policy, the logic and conclusions of your post are seriously undermined. My suggestion just goes to accuracy and disclosure." I have a number of music business books that describe the self-publishing process, as well as trying to answer the "should I go with ASCAP or BMI?" question. I found a number of factual problems with the books when I actually did the research work myself, and the books consistently say "ASCAP and BMI are about equivalent" which I think is completely untrue: BMI's publishing agreement is *much* worse. - go with ASCAP. It's free, and their agreement is much less evil than BMI's. - you don't need to incorporate, don't believe the music business books, you just need to pick a name for your publisher, which is your "doing business as" name. You'll get checks to that name, so you want to choose a publishing company name such as "John Buckman Publishing" (ie, your name + publishing) so that the bank lets you cash the checks you receive to that name. - the musician should be signed up with the same organization as the publisher, and since the publishing agreement is much better at ASCAP, I'd recommend both musician and publisher sign with ASCAP. If the musician is already on BMI, they can leave and transfer to ASCAP. However, I have no knowledge that you'll see more money from one or the other. - both ASCAP and BMI can collect "DART" royalties for you, which are various digital audio royalties, and both have a one year cancellation option, so it's a good idea to check that option in the signup form, and I couldn't see much difference in the ASCAP vs BMI agreements for this. - BMI wants $150 for you to be a publisher. ASCAP is free. BMI wants even more if you're a registered company. - The BMI agreement is for 5 years, automatically renewing in 5 year terms forever, and you can only cancel in a specific window a few months before the 5 year term expires. 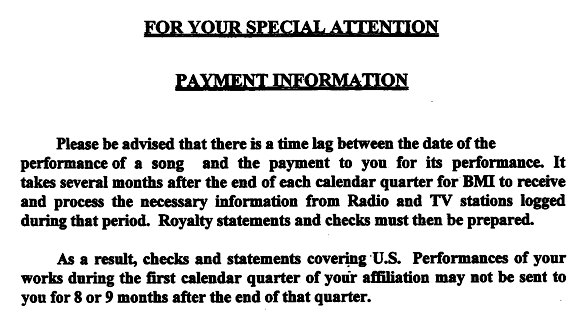 The ASCAP deal, on the other hand, can be cancelled any year, if you notify them between 9 and 6 months before the anniversary of when you signed with them. - The ASCAP agreement asks for less rights than the BMI agreement does. The BMI agreement, in my opinion, goes way overboard in the rights they get. Whoa! In case you missed it, you "sell, assign and transfer" (that means you lose these rights completely) *all* the rights to perform or license the work to be performed, anywhere on the planet. This means you cannot sign up with a foreign publishing company as well, if you go with BMI. whereas ASCAP just asks for the rights they need, which is much friendlier than BMI's agreement, which asks for all your rights and gives you permission to do what the government forced them to. this means that if you're a musician and self-published under BMI, and you're signed to Magnatune, you need to send BMI a copy of your signed Magnatune agreement within 10 days of signing with Magnatune. No such requirement exists with ASCAP. As I understand this, if you assign a creative commons license to your music, and your publisher is signed with BMI, you also need to send the Creative Commons license to BMI, as that's also a performance license and BMI commits you to telling them of it within 10 days. ASCAP asks for a (non-exclusive) right to license your music, and the right to sue people to enforce your copyright. That's all a collection society needs to do its business, it doesn't need to own the rights as BMI does. That strikes me as much more reasonable. Clause C. gives them the right to adapt or arrange the work, however they want (think "techno remix") for performance use. I don't see ASCAP getting this right in their agreement. this says that BMI is your lawyer and can act on your behalf in any way they see fit, and are under no obligation to act in ways that you direct them to. Compare that to the ASCAP agreement, where they only get the right to sue to protect your copyright. I could go on and on about this BMI agreement, it's really that bad. - Perhaps it's silly, but the BMI agreement is an ancient scan of a typed agreement, with two "page intentionally left blank", and you can't search the text, because it's all graphics. The ASCAP agreement is a word processing document, can be searched and is clean and new. BMI's agreement is 36 pages, vs ASCAP's 12. The BMI document has a bad attitude from the very start, with a huge-font disclaimer as the cover page page that you should expect a 6 to 9 month delay in getting paid, longer if it's foreign performance money. I'm sure ASCAP has the same issue with delays, but the whole look and tone of the BMI agreement is off-putting, with the bad-quality scan, don't-bug-us-about-delays, nasty rights grants and bad print quality. - Also perhaps silly, but the BMI agreement has several lobbyist-smelling exceptions to the agreement, such as for Opera and Ballet, next to some particularly nasty looking legalese. This makes me think that this legalese is bad news, and that some powerful lobbies got them removed just for their case. The usual disclaimer: I'm no lawyer, this is not legal advice, and you should consult a lawyer before doing anything, such as using any of this advice. Some time ago, I thought Magnatune should launch its own music publishing company, named "Not Evil Publishing" because publishing agreements are more-or-less without exception, evil. - they register themselves with ASCAP or BMI as your publisher, ie, as the person who now owns the song-writing right to your songs, and gets paid for that. - if someone wants to license your music, they negotiate a price for the publishing part of it and do the contract. They will tend to ignore requests for licensing that are for small amounts of money, and are notoriously difficult to work with to get licensing rights. In my opinion, they only make licensing deals more difficult, as they are usually greedy and inefficient. - when a music license occurs for film or TV, they notify ASCAP or BMI of that license so that ASCAP/BMI can include it in their royalty calculations. This is a simple one page form you can fill out yourself. - they *may* do a foreign sub-publishing arrangement, where a publishing company in each foreign country represents your publishing interests (typically for a 50% cut, exclusively in that country, and in perpetuity), in order to get a piece of "black box" revenue and in order to get better book-keeping in that country. Payments between collection societies across countries is notoriously badly done, and so much more money can be collected in a country by having a company registered in the country where the money is actually collected. However, 50% is a steep price to pay, and some of the largest publishers (ie, Warner/Chappell) have all their own foreign offices. "Black Box" revenue is all the money that is collected in a country that can't be pin-pointed to a specific song-writer (ie, no records exist in their database, saying who to pay). The collection society keeps the money safe for a few years (I believe it's 3 years) and then splits the money among __publishing companies registered in that country__ based on some formula of the society's choosing. That's why foreign sub-publishing can be so lucrative, because collection societies are notoriously (by choice?) sloppy with their records, and vast sums of money don't find their rightful home. But, you have to sign a really nasty sub-publishing contract, which is for life, and loses you 50% of *all* publishing revenue in that country. Many publishers don't do a foreign sub-publishing deal because of this. - publishers typically take the publishing right (ie, the song writing right) for the songs in perpetuity. Sometimes, the publishing agreement will be with the songwriter for all the songs they have and will write in the future. - most legitimate publishing companies pay the songwriter an advance for signing a publishing contract, but many companies realize that musicians aren't well enough educated to realize they deserve money for handing their rights over to a publisher, and so don't pay anything in advance. A close friend of mine found that the record label she was signed to had sold her publishing rights for a hefty advance, and had kept the money for themselves. - some publishers will claim that they audit ASCAP / BMI royalty reports and can get you more money from those collection societies. I've quizzed publishers on what this really means, and I get a lot of hand-waving vagueness. I suspect this is a bluff, as many publishers don't claim this, but also because the formulas ASCAP and BMI use to pay out royalties are amazingly complicated, and hard to unravel and understand, so it's unlikely they could be easily audited. - this is REALLY IMPORTANT: if your music has publishing royalties collected (ie, played in a film/tv) only 1/2 the money will be paid to the ASCAP/BMI musician member, with the other 1/2 held unpaid if there is no publisher registered for the song. You literarily are paid half as much from ASCAP/BMI if you don't register your songs with a publisher (which can be you) with ASCAP/BMI. Or, put another way, you could be making twice as much money from ASCAP/BMI just by filling out some forms. The bottom line is that a publisher takes rights away from the song-writer, often pays nothing up front for that right, and doesn't do much more than fill out a form to ASCAP or BMI when a song is licensed, and gets in the way when/if a music licensing is needed by a film-maker. I've seen a lot of licensing deals fall apart because the publisher (whose permission is needed) simply doesn't return phone calls. They do no marketing: all they do is get checks from ASCAP or BMI and pay themselves a cut. In fact, the situation is so bad, that ASCAP (and BMI) were sued by the government and what they must and must not do is largely controlled by the government (ie, ASCAP's "consent decree" http://www.ascap.com/reference/ascapafj2.pdf) and my understanding is that one thing they must do is advertise in popular music magazines that as a musician you do not need a publishing company and that you can register as a publisher yourself. In the old days, ASCAP/BMI colluded with publishing companies to convince musicians that the publishing companies were essential, and this got them in trouble with the US government. My next blog entry will explain the differences between ASCAP and BMI, and which I think is better, and how to register as a publishing company with one of them. BERKELEY, Calif.--(BUSINESS WIRE)--May 11, 2006--Next generation record label Magnatune today announced it has launched 45 new podcasts in a wide array of musical genres. The talk-free podcasts are updated weekly from the growing Magnatune catalog of over 200 independent recording artists, and each features a full hour of uninterrupted music. "As a record label that's leveraging the Internet to change the whole music industry for the better, we felt it was important to use the medium of podcasting to its fullest potential," explains Magnatune founder and CEO John Buckman. Buckman himself developed the algorithm against which the podcasts are generated automatically each week. The Magnatune podcasts imitate the radio "rotation" model, featuring new songs more, and making "hits" by playing the strongest tracks more frequently. Several podcasts have already seen several thousand user downloads since the launch, including the Bach podcast with 30,000 downloads in just over a week. In addition to a wide array of podcasts in different genres such as classical, ambient, jazz, rock, pop, world, and electronica, Magnatune has also made available several podcasts by mood, including "Wake-Up" and "Relaxing" podcasts, as well as programming in specific musical niches such as an all-Mozart podcast, and an all-sitar podcast. New episodes of all 45 podcasts appear each week and are available from the Magnatune Web site as well as iTunes. In addition to its own podcasts, Magnatune makes its catalog available for free to other podcasters -- a policy that differs dramatically from that of many other record labels and which has contributed to Magnatune's rapidly growing popularity online. Founded in 2003, Magnatune (http://magnatune.com) is an independent, online record label that sells and licenses music by over 200 independent recording artists in every genre. Magnatune supports "fair-trade music" by sharing equally all revenue with recording artists. All music can be previewed in full, free of charge before purchasing. Some time ago, I mentioned that Magnatune was signing with a music company that distributes digital music to libraries. The idea is that a library buys one copy of an album and can lend it out for a 14 day period, after which it can be re-lent out. There is DRM on the lent-out version preventing them from using it after 14 days. However, we opted to allow CD burning of the files, which does mean they can circumvent the DRM, but more importantly, it means that people borrowing the music can play it on an ipod. The library company was extremely excited that we allowed burn-to-cd, because evidently a number of libraries refuse to buy any digital content that doesn't have a bypass-the-drm feature, since they may be locked out of the content in the future that they legally bought. Since Naxos, for instance, does not allow burn-to-cd, with their library offering, they thought this was a big plus for our offering. 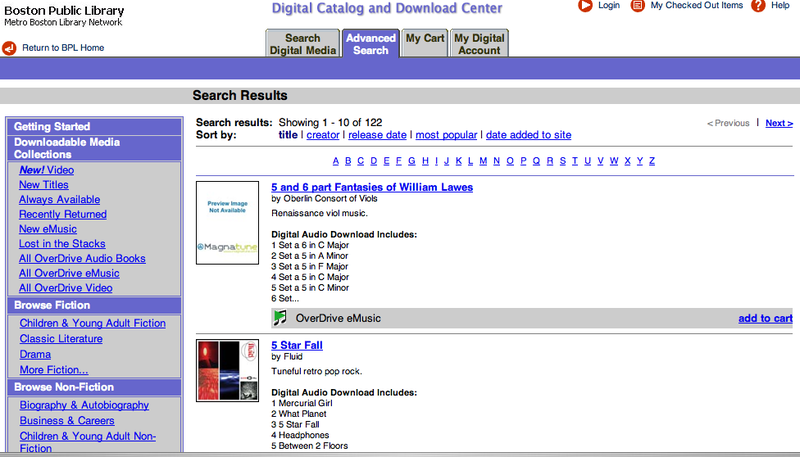 I checked in today with the company we work with, called Overdrive (Digital Library Reserve) and they inform me that Magnatune digital music has been bought for lending by six libraries: Boston Public, Nicholson Memorial (TX), Brooklyn Public, Queens Public, Kansas Virtual Library (group of Kansas libraries) and Maricopa County (AZ) and that over 800 albums have been sold. If you have borrowing rights at any of these libraries, do check out some of our music, since your library has already bought copies for you! If you do an "advanced search" at the Boston Public Library http://overdrive.bpl.org/ for "Magnatune" as the publisher, you'll see that the Boston Library bought 122 albums! Magnatune gets paid for those albums, which of course then goes to the artists, so this is great. If an album is requested frequently, and is already out on loan, library are inclined to order several copies, which may be a route to further sales.